It's Time to Make Your Parol! As we put together activities and events that will introduce our youth to All Things Pinoy, we'll post occasionally the invitations that we receive from local organizations. We hope that you will find something that fits your schedule and your kids' ages as you take them on this journey to learning more about our history and heritage. 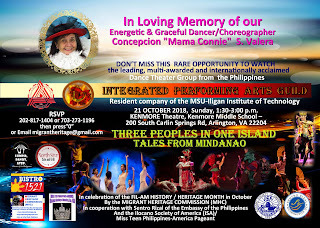 In celebration of the Filipino-American History Month, in cooperation with Sentro Rizal of the Embassy of the Philippines and the Ilocano Society of America (ISA) Miss Teen Philippines-America Pageant, the Migrant Heritage Commission (MHC) proudly presents "Tales from Mindanao" a cultural performance in loving memory of our energetic and graceful dancer-choreographer Mama CONNIE VALERA. This is part of the 2018 Integrated Performing Arts Guild (IPAG) US Cultural Mission Tour. 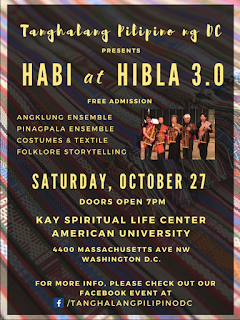 Parking is free at the Katzen Arts Center across the main entrance to American University. 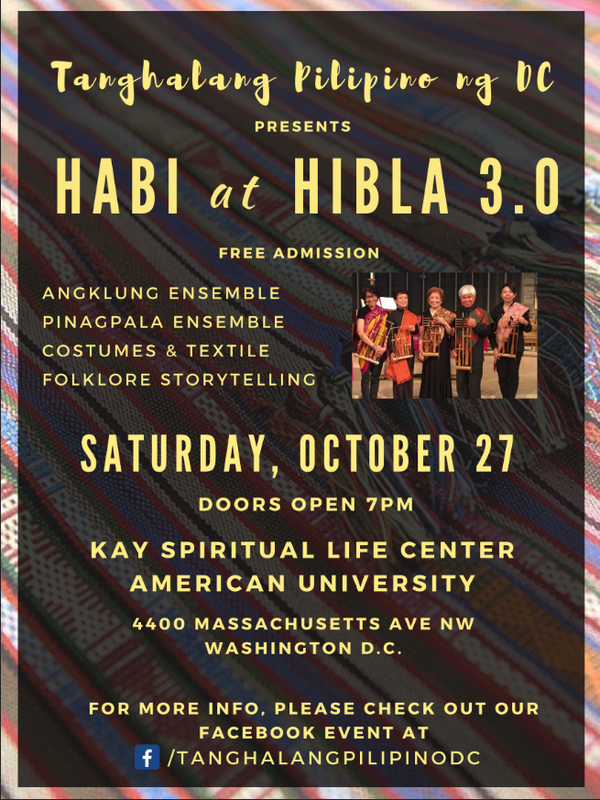 Tanghalang Pilipino ng Washington DC brings to the stage “HIBLA at HABI 3.0” (Our Cloth, Our Story), an evening program featuring indigenous musical instruments and traditional and tribal costumes. 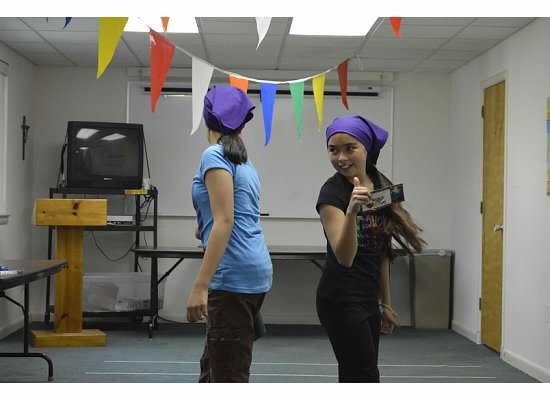 When we started in 2007, our goal was to teach our Filipino-American youth everything Pinoy--a little bit of our language, a little bit of our culture, and a whole lot of being Filipino in another culture. Through classes, workshops, and various celebrations, we raised a generation of first- to fifth-graders into high school- and college-aged kids, who appreciate and value their parents' heritage and traditions. But we don't want to stop there. Paaralang Pinoy is dreaming big, and moving forward with a new set of programs to serve the Filipino-American youth. PP Music Program teaches and exposes our youth to Filipino church hymns, traditional folk songs, and Original Pinoy Music (OPM). Included in this program is a Family Choir that assists in the monthly Filipino Mass and the annual Simbang Gabi with the Bishop. PP Cultural & Arts Program focuses on instruction in the different folk and ethnic dances, and in the modern interpretation of traditional dances. This program allows our youth to represent the Filipino culture in dance performances. Paaralang Co-op Program consists of parents working together with teacher-volunteers in sharing the Filipino culture to their children, and includes storytelling sessions, demonstrations and workshops, and conversation practices. Though geared to rising 1st to 5th graders, older children are given tasks, and earn community service hours for their assistance. PP Youth Group prepares our Filipino-American youth to lead the larger Filipino community in American society, and includes leadership formation seminars, mentoring sessions, and educational field trips to Fil-Am events. We will be launching these programs on September 15, 2018, the celebration of the Feast of Filipino martyr, San Lorenzo. 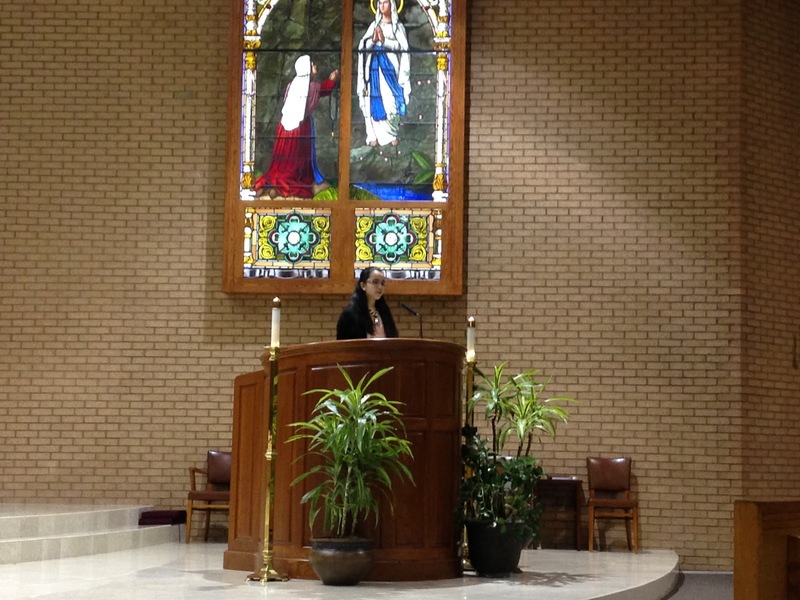 Join us for 7:00 p.m. Mass and the reception that follows at St. Bernadette Catholic Church, and find out more about what's new with Paaralang Pinoy. Sige na! Sali na kayo! It's that time of the year again when Pinoys all over the world clean up multi-colored, star-shaped lanterns to decorate their homes. Yes, there may be trees and garlands, elaborate creche scenes called belen, and even fake snow. But nothing says "Filipino" more than the parol. 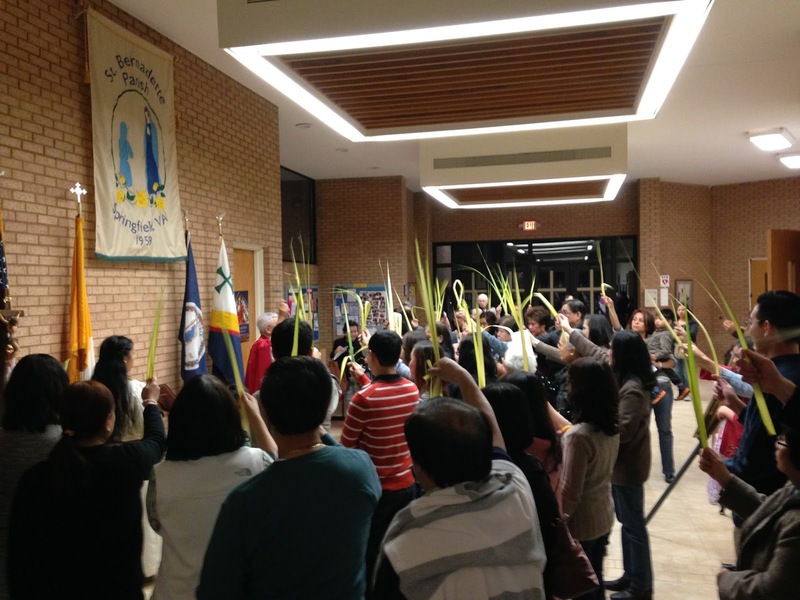 Here in the Northern Virginia area, we will have a Simbang Gabi kick off event on Saturday, December 9 at Queen of Apostles Catholic Church, which includes the annual Parol-Making Workshop. 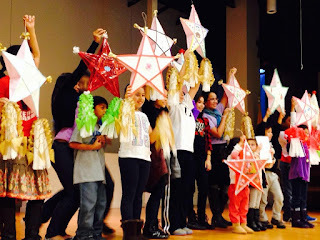 Prepare for Christmas this year by making your own Christmas Star Lantern (parol). Bring your own decorations or embellishments (e.g. Nativity or family photos, stickers, ribbons, etc.) or use the construction paper provided to create your own ideas. You might want to bring a mug to use as a stand for your parol while you’re working at it. Sige na, sali na kayo! Space is limited, so sign up today! For additional information, to RSVP or to reserve your kits, please email: prayer.gardens at gmail dot com. This event is jointly sponsored by the Fil-Am Community Ministry at OLGC, Paaralang Pinoy, and the Filipino Ministry of Northern Virginia in collaboration with the Catholic Diocese of Arlington’s Office of Multicultural Ministries. Nothing says "Filipino Christmas" better than a parol. The ubiquitous Christmas Star Lantern marks many household windows, store fronts, and street lamps as early as September. 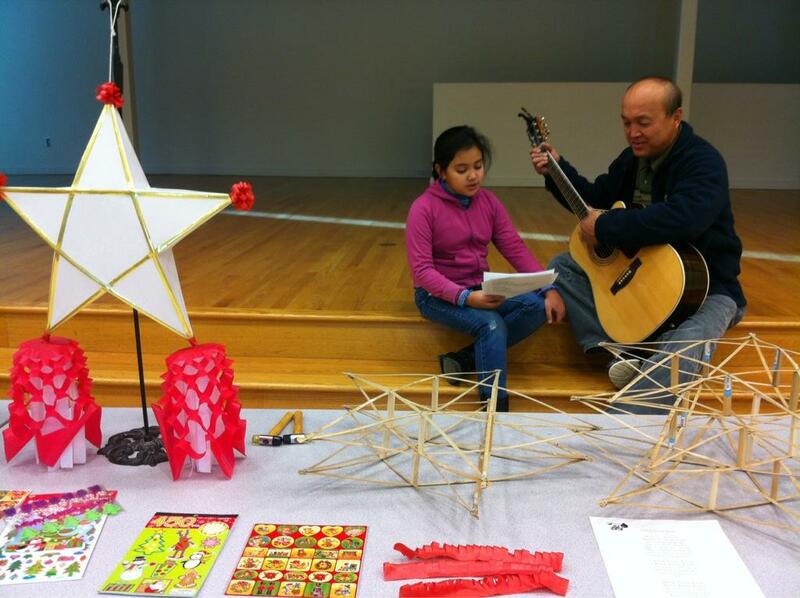 Share this Filipino tradition with your children, and join us at our annual parol-making workshop. Bring your own decorations or embellishments or use the construction paper provided to create your own designs. A donation of $15.00 will give you a complete kit. We have moved our Spring Workshops and integrated them with our upcoming Fall Classes, tentatively scheduled for October and November 2016. Watch this space for updates! Are your kids ready to use their hands and move their bodies? Paaralang Pinoy is once more offering our Slice of Pinoy: Spring Workshop series next month to introduce your kids to a bit of dancing, some martial arts, and a lot of playtime, Pinoy-style. On a special cooking demonstration day, they will make and taste pichi-pichi, and we will have homemade bibingka available for you to buy and take home. 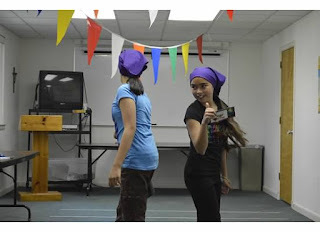 Our workshops are geared to rising 1st to 5th graders. Though we can accommodate your little ones, be prepared to assist them as all our sessions will immerse them in the activity. Fees: $10/child/class or $32/child for all Spring workshops if paid in full by the first day of class. We welcome our parents and friends, mga lolo at lola, mga tito at tita, to join us in introducing our children to our culture. 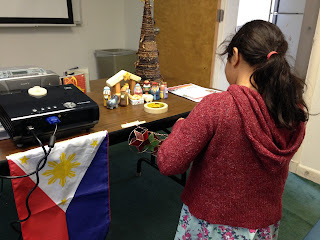 Watch your kids learn to love their Filipino heritage, and stay to teach them more from your own experiences and skills. Teacher volunteers are the lifeblood of Paaralang Pinoy, and we'd like you to be part of this joyful sharing of talents. Registration to our workshops will be open soon. Just click on the signup genius button on the right.